It is said that the best camera you can have is the one you have on you. But what if you don't have one on you? The other day I was walking home and spotted a great picture but I didn't have my camera with me. 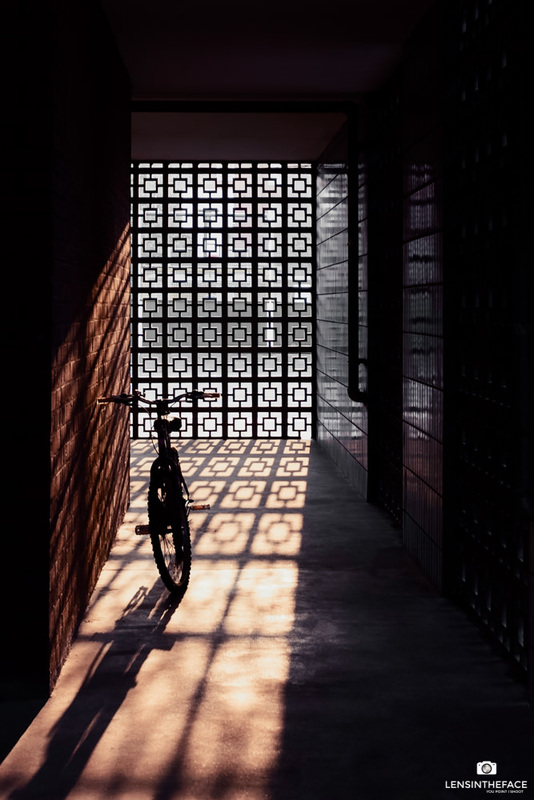 The scene was a bike in the shadow of open stonework as the sun was going down. I quickly committed to the shot and ran home to pick up the camera and the Stubby. I got home, dumped the shopping on the kitchen counter, picked up Gerry and Stubby checked battery and threw in a card that was lying around. Ran full pelt back to the spot to find the sun had of course moved on, well technically the Earth had moved but you know what I mean. The Earth orbits at 107,000 km/h so my land based foot speed would not have made much difference, however the orbit had helped a little as the shadow was now in the path of the bike a bit better than before. The stonework you can see in the photo was on the opposite side so I had to push Stubby through one of the gaps. I tried lower down but this wasn't quite right. I saw the scene from head height initially and luckily there was a gap at the right height also. I fired off a couple of frames to make sure I had the scene I wanted and then slowly walked home. Checking the shot in the computer I noticed the scene was more yellow than I wanted. TO me the scene was better as you see below. I straightened the angle so the walls were more vertical and adjusted the colours and sharpened a little.